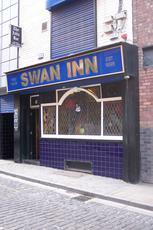 Fourth pub on my short Liverpool crawl yesterday was the Swan. It was quiet, with only a couple of other punters in, along with the barmaid. But with Guns 'n' Roses on the jukebox, it was only quiet in one sense. Ales on were Phoenix Hopsack, Springhead Blind Tiger, Black Sheep Brian, Leeds Midnight Bell, Robinsons Trooper, Marstons Owd Rodger & Cotleigh Old Buzzard. Wobbly Bob was off. The usual real cider is Rosie's Triple D. Rock pub that looks nothing from the outside, but is worth a visit if in this area of Liverpool, populated with late night bars and clubs. This place gives me the feeling of being almost like something you may see in a German bar, quite dimly lit, a bit of a bare feeling to it and wooden benches and stools. There's a downstairs room and a room upstairs (where the toilets also are). The downstairs room is reasonably big with U-shaped bar. The Ales on were Strathaven Timorous Beastie- 3.30 a pint and quite nice and well kept, Cotleigh Snowy, Phoenix Hopsack, Cottage Pacific, Otley Coolships Pale, Spitting Feathers Gingerbread Latte Sout. The pump that seems to do Wobbly bob by Phoenix regularly was off (which actually lead one guy to walk out). Most of the clientele in here were older rocker types and this seemed to reflect the music that was being played (Renegade by Styx is the only one I remember but it was that era music), I thought the music was quite pleasant and not too loud. Things that were hung on the wall included branded Mirrors from Guinness and Leffe and Guinness. Not a bad place I thought and I would come back here for one or two, don't think I'd hang around. Quieter and not quite as noisy as previous visits. The pub itself is still very much unchanged. Service is good and the ale range is still fine. Yesterday was Grafton Coco Loco, Mr Grundy's Sniper, Jennings Summit Else, Robinsons Trooper, Cottage Defiant, Wadworth Dirty Rucker & Phoenix Hopsack & Wobbly Bob. The real cider can be found at the end of the bar. It's always Rosie's Triple D these days. Still worth visiting for a quick one, or more of a session if you're into the music. Another pub I hadn't been to for a couple of years. I can't remember having visited here on an evening before. I think all of my previous visits have been at lunchtime. Whilst it was no busier, it did seem noisier than normal. Sometimes I find the music ok in here. But the selection from the jukebox was more annoying this time. So we supped up quickly and moved on. Service was good and the cider (Rosies Triple D) was fine. The ale selection was Cottage Full Steam Ahead, Phoenix Hopsack, Elland Who Da Ell, Hydes Original & Bridgnorth Kings Escape. Based on this visit, it will be another couple of years before I return. When I do, I must remember to come back on a lunchtime. I've been in The Swan many times, although less frequently as the years go by. The key word is inconsistent. Sometimes I think it's a great boozer, good ale and the best juke box anywhere I've been, the next visit I get poor quality ale and indifferent service. The juke box is the only constant, but it's not enough to stop me going elsewhere. Liverpool is blessed with real ale pubs, so plenty of alternatives.